This stop actually includes the two last drives in eastern Montana, on our way to North Dakota. 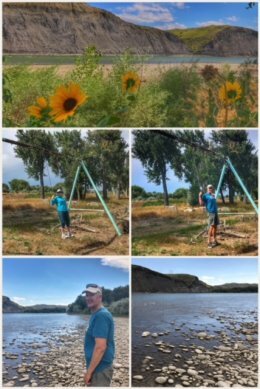 We first camped outside of Billings, a fun city on the Yellowstone River, and later, we camped right in Miles City, also on the Yellowstone River. As we drove, all we saw were acres and acres of hay; we have never seen so much hay in our lives. Billings, the state’s largest city, is built in a valley, with the Yellowstone River along the south and the large sandstone cliffs (rimrocks) to the north. It was nicknamed the Magic City beaucase of its rapid growth after being founded as a railroad town by the Northern Pacific Railroad in 1882. In the early 1800s, WIlliam Clark (of Lewis & Clark, the Corps of Discovery) traveled through the area, stopping at what is now known as Pompeys Pillar (east of Billings) — and carved his name into the stone, the only remaining physical evidence of the expedition that is visible along their route. Our campground was right along the Yellowstone River, and we enjoyed some very nice hikes along the river. 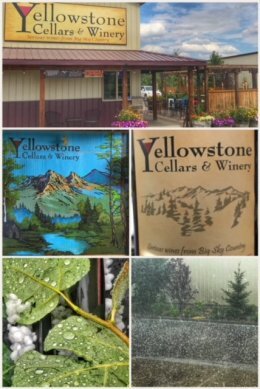 More importantly, Billings is home to the Yellowstone Cellars and WInery, which means we were finally able to get back into wine-tasting after several weeks of being in small towns. If you are in Billings, this winery is most definitely worthy of a stop. Patty, our server, was wonderful, and we had a great time chatting with her. Later, we met Clint, the owner, and had a fun tour of the winery — as well as its (and Clint’s) colorful history. The selection of wines, especially reds, is quite wonderful, and the tastings are free. Plus, on weekends there is live music. The grapes are actually grown in Washington’s Yakima Valley, but are harvested and trucked to Billings, where Clint goes to work on the transformation from grape to wine. We picked up a mixed case of reds, though our favorite was the tempranillo. The afternoon at the winery was made all the more memorable by a crazy summer storm that brought rain, hail, and high gusts for about 15 minutes. Next we followed the Lewis & Clark trail up to Miles City, a town with lots of history, and located at the where the Yellowstone and Tongue Rivers meet. 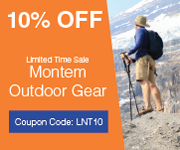 The area is steeped in history, from General Custer’s time to cowboys and cattle drives. We enjoyed riding our bikes through town and walking along Yellowstone River. 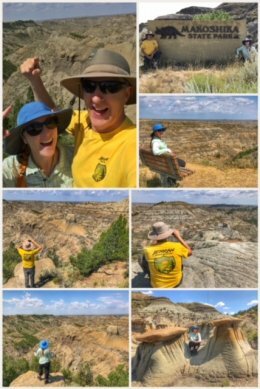 But our main reason for stopping here was to visit Makoshika State Park, “the Badlands of Eastern Montana,” located in Glendive, and at 11,500 acres, the largest state park (preserving about 20 percent of the badlands) in Montana. The park’s name comes from the Lakota phrase maco sica, meaning bad spirits. The badlands, which are only about 80 million years old, get their colors primarily from the mineral composition — with iron producing the reds and yellows and coal producing the black. But the park is not just about the amazing badlands of fluted hillsides, pinnacles, and caprocks; it is also home to fossils of numerous late Cretaceous dinosaurs, including triceratops, edmontosaurus, and hadrosaurs (shown in the collage). 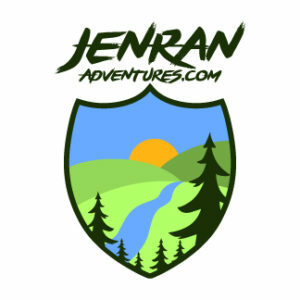 Lots of trails abound, and we started at the top and worked our way back down toward the visitor center, hiking around the Amphitheater, and then down to Kinney Coulee Trail, Cap Rock Trail (all the way down to the Natural Bridge), and ending with the Diane Gabriel Trail (which leads to the Hadrosaur Trail). It was hot and sunny, but we made sure to stay hydrated all along the way. On a side (camping) note, interestingly, Billings and Miles City are home to KOA #1 and #2, respectively — the first KOA ever, and the first franchised KOA — and we stayed at both of them. 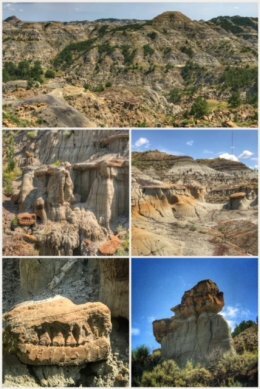 Next up for us is North Dakota and Theodore Roosevelt National Park — both a state and a park neither of us has ever visited. Onward!